Running is a very good habit for your health with no cast. 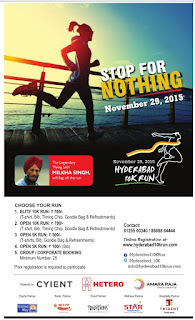 To make your self as part of this health habit and to make social get together, Hyderabad 10K run foundation was established in the year 20013. The main objective of the 10K run is to bring entire city together and to promote the health and fitness among the citizens of Hyderabad. The 10 k run is actively conducting many events and 10K run is the biggest event where all kinds of citizens gather together to celebrate the running event with unity. This organization is "not for profit" organization and any donations towards this organization can be income tax exempted under section 80G. Don't miss the opportunity to be part of it and make your self more healthy and become socio-economic. Stop for Nothing November 29, 2015. 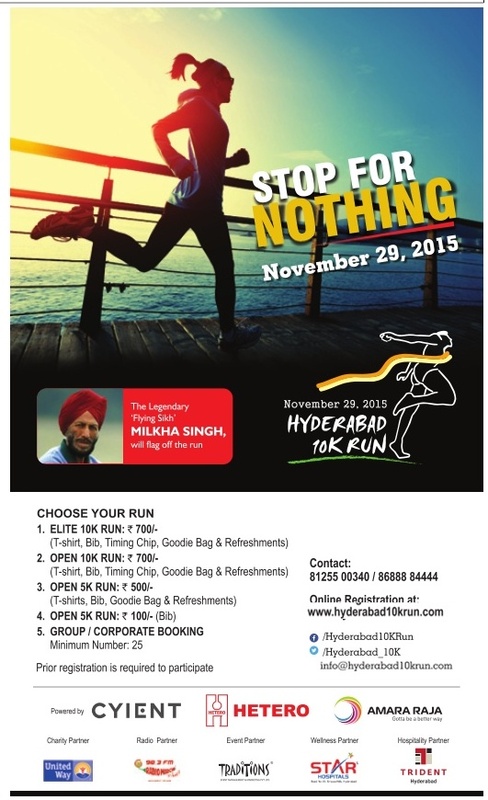 Hyderabad 10k run.